Powers/Abilities: Due to Madcap's exposure to Compound X07, his body has mutated greatly. He can only feel pain under certain conditions and has a very rapid healing factor that can heal gunshot wounds, third degree (deep tissue) burns and other injuries within seconds. He can survive being flattened by a steamroller, and his recuperative powers take only seconds to recover from even this. Should he lose a limb, he can reattach it. 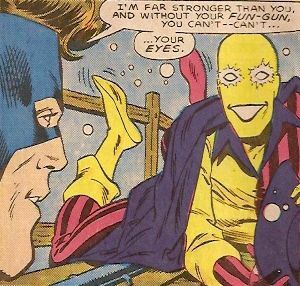 Madcap's eyes give off a psionic effect that can cause others to act irrationally, to a dangerous degree. He often uses a prop gun (his "Fungun") to channel his power. History: (Captain America I#309 (fb)) - The man who would become Madcap was a Christian with strong beliefs in his faith. On their way to a field trip, the young man's church group's bus was accidentally rammed by an AIM (Advanced Idea Mechanics) tanker truck carrying Compound X07. The man was thrown from the crash, landing in the Compound, while everyone else on the bus, including his sister and parents, perished. AIM members arrived on the scene, but believed him to be dead as well. However, his body absorbed some of the X07, and began to heal. He was found and brought to a hospital, where he miraculously recovered from his injuries. When he awoke, he was informed of his family's deaths, and his mind snapped. He tried to commit suicide by jumping in front of a moving vehicle, but after being struck, he simply got up and watched the scratches and cuts heal as well. No longer believing the world made sense, he sought to show others the "truth." (Captain America #307) - The young man entered Ace Costume Shop in Manhattan, and used his powers, channeled through a prop gun (the "Fun Gun") he'd bought, on the owner, sending the man into a delusional hallucination. He then stole a costume and became Madcap. Going on a rampage, Madcap attacked uptown Manhattan, causing a massive traffic jam when he used his gun/powers on dozens of people. Jack Monroe, the superhero Nomad, was working as a grocery stocker nearby when the mass chaos was caused. He investigated as Nomad and found Madcap among all of the temporarily insane people. He attacked the prankster, and actually broke Madcap's jaw with a punch, but was stunned to see the villain simply pop it back into place. Nomad was shot by Madcap's gun, and also went on an insane spree before coming to his senses. Meanwhile, Madcap escaped. On his way home from work, Monroe did not realize that Madcap was in the next subway car. (Captain America I#309) - A few nights later, Madcap pranced around Coney Park and was attacked by a gang of thugs. They knifed him, but he recovered and blasted them with his powers before heading home. When he arrived, he was surprised to find Nomad waiting there for him. Nomad played to Madcap's senses and got him to explain his origins. The next morning, the two, in civilian clothes, fled a restaraunt without paying. Nomad's beliefs began to conflict with his trying out Madcap's lifestyle, and he finally had to stop playing along when Madcap blasetd a woman pushing a baby cart. Nomad saved the woman and the baby, and attacked Madcap, trying to use his own "Fun Gun" on him (to no effect). Not knowing that Captain America (Rogers) had shown up to watch the events, Nomad chased Madcap to the top of a Coney Island rollercoaster. There, the two fought, with Madcap revealing that his powers came from his eyes, not the prop gun. Nomad used his cape as a shroud to blind Madcap and eventually defeated him. Nomad was congratulated on the win by Captain America. 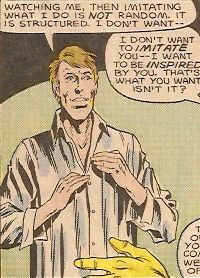 (Official Handbook of the Marvel Universe Deluxe Edition#7) - Madcap was incarcerated in Bellevue Hospital. (Daredevil I#234 (fb)-BTS) - Madcap escaped from Bellevue, walking out the door one night. (Daredevil I#234) - Madcap busted up a group of gun smugglers working for the Rose (Fisk), but not without getting shot between the eyes (though he quickly recovered). He was approached by Dollar Bill, who offered to make Madcap a star on his cable access televison show. The Rose put a $5,000 bounty on Madcap's head for botching one of his operations. Daredevil, who had come across the crazed smugglers, began investigating Madcap as well. Dollar Bill put Madcap on his The Dollar Bill Show, where Madcap displayed his powers by plunging a knife into his stomach and pulling it out. After it immediately healed, Madcap blasted Dollar Bill with his powers. The next day, after the effects wore off, Dollar Bill took Madcap out onto the streets of the city. One of the Rose's men recognized him and called his boss. A cab under their employ struck and ran over Madcap, but he got right back up. Madcap was then abducted by more of the Rose's men just as Daredevil arrived. Madcap was tied to a post by the men, and a man named Max the Axe entered the room, brandishing a very large axe. 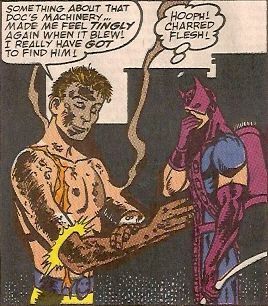 He swung it into Madcap's chest, just before Daredevil burst in. The gangsters threw molotov cocktails into the room, hoping to burn Daredevil alive. When Daredevil went to retrieve Madcap, the prankster was still alive. Daredevil opted to save the life of the unconscious Max instead, and Madcap was burned alive in the ensuing fire, singing the entire time. His body burned beyond recognition, Madcap was taken to the morgue, but he still managed to recover. He showed up later that night at Dollar Bill's apartment and suggested they change the name of his show to the Madcap Mystey Hour. (Power Pack I#34) - While watching television, Katie Power (of Power Pack) and Franklin Richards (in his "dream form" astral form) came across the Madcap Mystery Hour. Both were amused by this adult acting silly. Franklin's dream form materialized in front of Madcap and asked if he and Katie could go on an adventure with him, and Madcap agreed. Katie recovered Franklin's body from his home and woke him up. The trio then hit the streets, and soon came across a garbage truck. Madcap "investigated" the vehicle and got his head stuck in the compactor. Once freed, his flattened head returned to normal and the three continued their fun. After a while, though, Katie and Franklin realized that Madcap was acting irresponsibly and was dangerous. After trying to lecture him, he left them to continue his ways. (Sensational She-Hulk#9) - Madcap went to Central Park, where he proceeded to draw a crowd before leaping head-first off a roof onto the ground. The She-Hulk, who was in attendance, recognized Madcap, but was too late to stop him from using his powers to turn the crowd into lunatics. She-Hulk gave chase, but Madcap soon hit her with his powers as well. She managed to snap out of it, but he zapped her again, this time channeling through his Fun Gun prop. Again her superhuman system shook off the effects, but he got her a third time. As he tried to impress a group of New Yorkers by stabbing himself in the head, She-Hulk grabbed him and leapt away. She then beat the living hell out of him. Madcap popped back up, as his broken bones quickly healed. He taunted She-Hulk some more, but she declined to fight him, not seeing the point. What happened to Madcap after this is unknown. (Avengers Spotlight#29/1 (fb)) - Madcap returned to Hell's Kitchen, with Dollar Bill in tow. They were looking for Daredevil while taping episodes for the Madcap Comedy Hour. The Power Tools, agents of Karl Malus, arrived and kidnapped Madcap before assaulting Bill. (Avengers Spotlight#29/1) - Dollar Bill requested Daredevil visit him in the hospital regarding his friend's kidnapping, but Hawkeye showed up instead. Dollar Bill played the videotape showing the abduction. Hawkeye traced the license plate on the car in the video to a nightclub called Scuzz. There, he ordererd a drink, but the bartender pulled a lever, dumping Hawkeye through a trap door, where he found Madcap chained and hanging from the ceiling. Hawkeye was attacked by the Power Tools, but managed to free Madcap. No sooner than that, that the Power Tool member Handsaw severed Madcap's arm. He tried to mesmerize her, but Malus had equipped her (and the rest of the Tools) with special glasses. He managed to get the glasses off her and drove her temporarily insane, leading to her attacking her partners. Hawkeye and Madcap escaped the building before a self-destruct timer Malus had set before his departure, but Madcap went back in to retrieve his arm. The building blew up and Hawkeye wrote the prankster off as dead. Just then, Madcap re-emerged and attached his arm back in place. Having felt actual sensations from Malus's equipment, Madcap then leapt off, hoping to find the doctor. (Impossible Man Summer Vacation Spectacular#1/3) - The Impossible Woman brought her child Impia to Earth in hopes of having Reed Richards "cure" her so she would be "fun." While looking for Richards, the two witnessed Madcap dive from a tall building, smacking into the concrete below. Madcap picked himself back up and presented himself to the two aliens. Impossible Woman, desperate for someone to show Impia how to have fun, begged Madcap to teach her. Madcap agreed, in exchange for 20 hen's lips. Impossible Woman took off to go find some, leaving Impia with Madcap. Quasar, who had previously encountered the two aliens, arrived, only to be zapped by Madcap's powers. Quasar began to go on a crazy rampage, and Impia begged Madcap to stop him, but he refused. Impia managed to save Quasar and calm him down. Madcap escaped down a sewer manhole. (Marvel Year-in-Review 1992) - Madcap was present in the Bar With No Name when an employee dressed as Scourge shot at everyone to get the bar cleared for the night. Madcap happily dug some bullets out of his chest, and remarked "In most bars when they want you to leave, they just stop serving the drinks." (Ghost Rider III#33) - Madcap realized that by continuing his Madcap Comedy Hour show, he wasn't fully showing humanity the joke of life. He went to Grand Central Station, where he performed atop an information booth. When a security guard tried to get him to come down, Madcap zapped him. The crazed guard then began wildly firing his gun, shooting several people. Dan Ketch was nearby and came across one of Madcap's victims. Transforming into Ghost Rider, he tried to stop the carnage and confronted Madcap. He swung his chain at the prankster, and it wrapped around Madcap's neck. Madcap fell, snapping his neck. As Ghost Rider observed, Madcap healed and tried to blast him with his powers, but they had no effect. Ghost Rider than forced the Penance Stare upon Madcap, who felt its pain. Ghost Rider left, but Madcap soon recovered. Having felt actual pain again, Madcap promised to spill more innocent blood so that he could receive the Stare again. (Captain America I#442) - Madcap appeared in New York's Central Park with a bomb strapped to his chest. Declaring that he had lost all will to live because random acts no longer allured him, he intended to blow himself up. The young heroes Free Spirit and Jack Flag observed him and Jack Flag tried to stop him by placing Madcap into a headlock, but Madcap escaped thanks to being triple-jointed, and set off his explosives. Jack Flag was badly burned by the blast, but his superhuman durability enabled his survival. When Madcap saw that they had both survived, he accused Jack Flag of trying to get in on his act. (Thunderbolts Annual '97 (fb)) - Madcap was among the superhumans briefly released from their cells in the Vault when the Thunderbolts (actually the Masters of Evil) turned the power off and then rounded up the escapees (in an effort to cover up their retrieval of Moonstone (Karla Sofen)). Citizen V (Baron Helmet Zemo in disguise) personally defeated Madcap, and all of the escapees were returned to their cells. (Heroes for Hire I#10 (fb)-BTS) - Needing to protect a biotechnician/geneticist named Professor Wolfgang Hessler, Silver Sable put together a special Wild Pack team to guard the scientist while in Symkaria. Unbeknownst to anyone, the man Sable hired believing him to be Nomad (Jack Monroe), was actually Madcap in disguise. (Heroes for Hire I#10) - Heroes for Hire were sent to retrieve Hessler, and confronted the Wild Pack. In the middle of the battle, Madcap revealed his true self. (Heroes for Hire I#11) - The Wild Pack managed to defeat their enemies, though Deadpool escaped. Later, he returned, using his image inducer to pose as Madcap. He confronted the real Madcap and punched him hard enough to snap his neck. He recovered in time to try to battle again, but one of his adversaries, Cage, reverted to a mind-control planted by the Master of the World, and Cage and Hessler teleported away. (She-Hulk II#6 (fb)) - Madcap was among several superhumans (mostly criminals) sitting in the offices of the law offices of Goodman, Lieber, Kurtzberg & Holliway. He was reading a magazine. (Deadpool Annual V#1 (fb) ) - <Before Secret Invasion> After killing a bunch of ninjas Deadpool was going to assassinate Matt Murdock with a sniper rifle when Madcap appeared on the roof he was on. Deadpool decapitated Madcap, who told him he could not be killed. They stabbed each other with the ninjas' swords until they realized they couldn't hurt each other. Madcap used his insanity-inducing powers and they caused Deadpool to calm down and go sane instead of driving him crazy. Deadpool got out his sane dream and was finally going to shoot Matt Murdock, but to his and Madcap's surprise Murdock wasn't sitting at his desk anymore. Seconds later Deadpool and Madcap were kicked around by Daredevil, then got incinerated with a lightning strike by Thor, who just came by. When the pile of ash restored itself Deadpool and Madcap had become one being with Deadpool in control of the body. From this day on Madcap became a scond voice in Deadpool's head. (Ghost Riders: Heaven's on Fire#2 (fb) - BTS) - Blackout, Deacon and Orb recruited Madcap for Zadkiel's Ghost Rider Assassination League. (Ghost Riders: Heaven's on Fire#2) - Madcap was present when Blackout, Deacon and Orb picked up Vengeance (Kowalski) as the last member of their group. (Ghost Riders: Heaven's on Fire#4 (fb) - BTS) - Madcap and Scarecrow went to Jasper County and scared a few people at the county fair. They were arrested by the local police and sent to jail along with a bunch of drunk locals, the Bass Boys, who Madcap and Scarecrow slew over the night. (Ghost Riders: Heaven's on Fire#4 (fb) ) - The police found Madcap and Scarecrow in the cell with the corpses of the Bass Boys. (Ghost Riders: Heaven's on Fire#4) - Madcap found Jaine Cutter stealing a beer in a shop in Jasper County. He tried to discuss religion with her, but she shot him. He fled into an alley, caught the bullet from her Breathing Gun and drove the living bullet insane. When Jaine arrived in the alley she quickly fell victim to Madcap's powers as well. He took her to the county fair where he used her against her ex-boyfriend Hellstorm. Under Madcap's influence Jaine Cutter shot Hellstorm. (Ghost Riders: Heaven's on Fire#5) - Though Jaine's bullet shot off Hellstorm's ear he retaliated with a Hellfire blast against Jaine, which was enough to free her from Madcap's control. Jaine and Hellstorm then kicked the crap out of Madcap and Scarecrow. Madcap was ecstatic when Hellstorm's Hellfire caused him severe pain and asked for more, but Jaine and Hellstorm were already leaving. (Wolverine: The Best There Is#1 (fb) - BTS) - Winsor hired Madcap to join the Unkillables. (Wolverine: The Best There Is#1) - Madcap joined Winsor and other Unkillables in a night club where Winsor used the Corruptor's sweat to cause Wolverine and everyone else in the club to kill each other. (Wolverine: The Best There Is#2) - When Wolverine returned to the night club where Winsor had attempted to gain control over him the previous night, Madcap attacked him. Wolverine was driven insane by him for a few moments, but after regaining control over himself decapitated Madcap. They didn't care and pumped him full with bullets. (Wolverine: The Best There Is#3) - Madcap picked up his head and rejoined Contagion and the other Unkillables at the lab after Wolverine had finally collapsed. With his head back on his shoulders he listened at Contagion's ramblings aimed at Wolverine. (Wolverine: The Best There Is#4) - Scavenger and Madcap watched Yi Yang on a screen torturing Wolverine. Madcap compared Yi Yang to his dead sister and got into a fight with Scavenger, who acted like a creep about Madcap's dead sister, but Contagion ended the fight by threatening them with a virus that would cause severe hemorrhagic gastritis. (Wolverine: The Best There Is#5) - Madcap picked up Wolverine from his cell and brought him to the lab while telling a few jokes. They laughed at each others' jokes. (Wolverine: The Best There Is#6) - Wolverine covered up his eyes when he confronted Madcap, who ran away screaming when Wolverine convinced him that Madcap would ultimately pay for all his sins. (Wolverine: The Best There Is#7 (fb) ) - Wolverine remembered Madcap's insanity-inducing powers in nightmarish fashion. (Wolverine: The Best There Is#11) - Winsor infected Madcap with something, possibly a fungus-like infection, that attacked his eyes and kept him attached to a wall. (Wolverine: The Best There Is#12) - Winsor's son Flip telepathically sent a self-destruct signal into the virus that kept Madcap incapacitated. Madcap then joined Wolverine and the other Unkillables in devouring Winsor to end his threat. Afterward Harry Sikes and Marjorie Brink decided to keep Madcap and the other Unkillables in line by turning them into a mercenary crew. (Wolverine II#304) - Madcap attended a party hosted by Sabretooth in Lowtown, Madripoor. Wolverine crashed the party. (Secret Avengers I#29) - Madcap joined the Masters of Evil alongside hundreds of members in Bagalia. They attacked John Steele on behalf of Max Fury; Steele later died. (Secret Avengers I#30 - BTS) - The Masters of Evil were taken over by the Abyss, who sought to spread them to the outside world. (Secret Avengers I#31 - BTS) - The Abyss-possessed villains moved to Bagalia's borders as the Secret Avengers tried to stop them. (Secret Avengers I#32) - The Abyss was vanquished and the Avengers let the villains go free, having no authority in Bagalia. (Deadpool IV#58-63 - BTS) - Madcap served as Deadpool's second voice in his head. (Deadpool Annual V#1 (fb) ) - Deadpool once again planned to assassinate Daredevil with a sniper rifle and had already set a plan in motion to distract the other heroes. It didn't work and Luke Cage ended up bringing the bomb, Deadpool had set up, to him. He had no chance against the bulletproof Luke Cage and when he saw a glimpse of Madcap's origin, Madcap got pissed off and took control over Deadpool's body. Controlling Deadpool's body Madcap then used his insanity-inducing powers to force Luke Cage to dance. 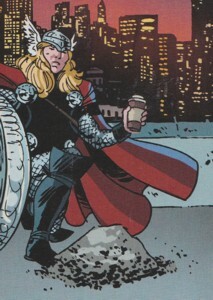 Thor arrived and fell victim to Madcap's powers as well, becoming Luke Cage's dancing partner. Inside their head Deadpool and Madcap decided to use the situation to their advantage and had Thor and Luke Cage rip Deadpool's body in two. 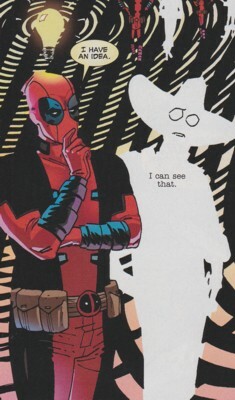 Deadpool and Madcap both regenerated seperately and where finally individuals again though only moments later they already missed being together. (Secret Avengers II#2) - Madcap was among the villains of Bagalia who battled the Secret Avengers, who sought to free Taskmaster. (Deadpool V#27) - Madcap attended the reception after the wedding between Deadpool and Shiklah and hung out with Domino (Neena Thurman). Comments: Created by Mark Gruenwald, Paul Neary and Dennis Janke. According to Deadpool Annual V#1 Madcap had been trapped in Deadpool's head throughout Daniel Way's run published from October, 2008 to December, 2012. 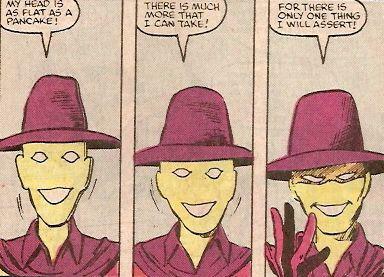 An easy explanation for Madcap still appearing during this era is that he sometimes took control over his shared form with Deadpool, because unlike Deadpool, who didn't know who the new voice in his head was, Madcap was obviously aware of his situation. Because Deadpool and Madcap are practically unkillable due to their healing factor it doesn't make much of a difference. Just a different costume with a different kind of insanity! These Deadpool/Madcap shared body appearances for Madcap include Ghost Rider VI#33, Ghost Riders: Heaven's on Fire, Wolverine: The Best There Is, Wolverine II#304 & Secret Avengers I#29-32. Profile by Madison Carter with Prime Eternal. Updates (Ghost Rider VI#33 to Deadpool V#27) by Markus Raymond.